Android Wear has gotten an update or two so far since its official unveiling a few months back, but those only brought with them minor new features. That said, it looks like the Lollipop update for Google’s wearable platform will come with many new things, and they’ve all been detailed in a comprehensive leak. Now that Android 5.0 Lollipop for phones and tablets is ready to start appearing in over-the-air updates near you, we assume Android Wear will be the next focus for Google – namely, getting it updated to Lollipop. And when that does happen, you’ll see a new Watch Battery section in the Android Wear app for mobile devices. This will act just like the Battery part of the Android Settings menu, showing you graphs and which apps ate the most of your battery capacity. Again similarly to what you can see in Android for phones and tablets, you’ll also get a Storage section, which will detail how much of your watch’s internal memory is occupied and how much is free, as well as which apps take up the most space. Next up, watch faces will become even more customizable. You’ll change them from the Android Wear companion app, and an official watch face API will surface with the Lollipop release. This will allow for weather notifications to be displayed directly onto the watch face. Further, you’ll be able to recover dismissed cards on your smartwatch with a swipe up. Theater mode and Sunlight mode will be new to the 5.0 Lollipop release for Android Wear. The former makes the wearable’s screen stay off until you double tap it or press the hardware button – even if you get notifications. It’s obviously meant for use in cinemas, and other such spaces where your watch lighting up all of a sudden would annoy the people around you. Sunlight mode, we assume, will instantly crank your watch’s brightness all the way up, so it becomes visible in broad daylight conditions. Until all smartwatches get ambient light sensors, this will prove to be a very useful feature undoubtedly. The new version of Android Wear will also bring with it some improvements for the visually impaired, including large text, color inversion, and magnification gestures. 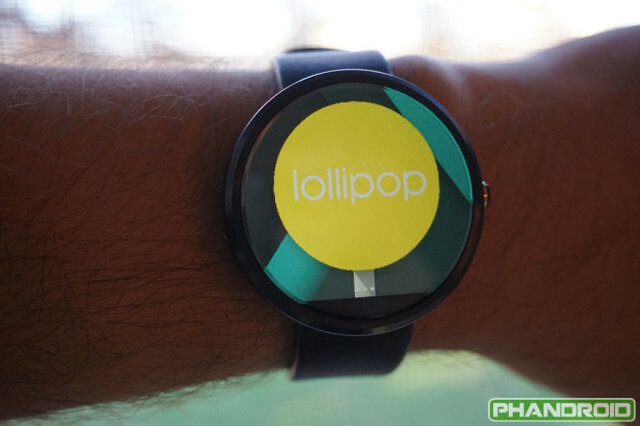 Lollipop for Android Wear may become available sometime in early December.